The Andhra Pradesh police which has already equipped itself with CCTV cameras and drones for the upcoming Krishna Pushkaralu in the state, has roped in another set of people to help them. In a bid to tackle pickpockets, chain snatchers and other such thefts that occur frequently in crowded places like the festival, the police has called on ex-convicts who have now changed their ways to identify suspicious behaviour. The police reportedly used a similar tactic during the Godavari Pushkaralu and had found it useful. The police have identified a massive 28,000 habitual offenders and 2.83 lakhs occasional offenders who have committed crime at least once and also collecting criminal data from remaining states. They have already mapped the localities and respective houses of such regular offenders to geo-tag the houses. If these criminals are missing from their homes during the 12 days of Krishna Pushkarams, the police will get an alert. 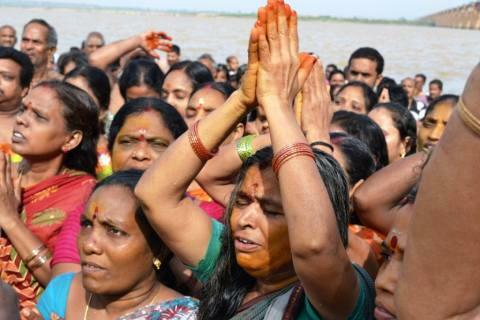 'Krishna Pushkaralu' is a festival of River Krishna which is usually held once in 12 years. The event is observed for a period of 12 days from the time of entry of Jupiter into Virgo. This year, the festival, which attracts lakhs of devotees from all over Andhra Pradesh and other states, will be held between August 12 to 24 in Krishna, Guntur and Kurnool districts. The Andhra Pradesh police will also use drones to help them with surveillance. Despite the state facing a severe cash crunch, the TDP government has already earmarked Rs 1080 crore for the festival. Three round-the-clock helpdesk numbers — 138,139 and 182 would also guide and assist people to the ghats. Chief minister Chandrababu Naidu last week said “A final review would be done on August 1 and nobody would be spared including officials and contractors if the works are delayed and if any work is of poor quality. Sufficient staff should be deputed at all ghats and also mobile medical teams along with ambulances should kept ready closer to the ghats."